The 33rd NitrOlympX, Europe’s largest drag racing event, took place at the Hockenheimring last weekend. From 17 to 19 August, around 260 international teams in nine Pro classes and eight first-class Sportsman classes competed in the fight for the FIA and FIM European Championship crown in the quarter-mile in the motordrome. More visitors than ever experienced the exciting non-stop drag race action in the hot summer temperatures: 44,000 fans drove the number of visitors to a new all-time high. This year’s NitrOlympX was also distinguished by top performances in sporting terms. A number of excellent results were already achieved in the qualifying rounds on Friday and Saturday, which served as an early indication of the track conditions: The spectators at the Top Fuel Bikes experienced the fastest “side-by-side run” in Europe. The Swede Rikard Gustafsson covered the 402 metres in an incredible 5.918 seconds, reaching speeds over 400 km/h – right next to him was the Greek Filippos Papafilippou with 5.980 seconds. This is the fastest ever in Europe. The four-wheeled representatives of the “Top Fuel” Section were in no way behind: Duncan Micallef from Malta crossed the finish line in 3.946 seconds, closely followed by the Briton Liam Jones with 3.978 seconds. At the end of the first day, three drivers were in the qualifying ranking with 3.9s times, whereby the Finn Antti Horto also set a new track speed record for the 1000-feet distance with 501.17 km/h. In the Top Fuel Dragsters, Liam Jones not only secured the event victory, but he also set a new track record on the asphalt of the Baden “Rico Anthes Quarter-mile” with a time of 3.882 seconds. The charming Briton appeared very relaxed throughout the weekend, and he brought this composure with him on the track. With constant 3.9s times in every run and a time of 3.882 in the first lap, just short of the European record of 3.87 seconds, Jones was simply unbeatable. Even Antti Horto could not overcome this, despite very solid performances. His 4.07 seconds were not enough to beat Jones’s 3.994 seconds to 490 km/h. In the Top Methanol class, Timo and Dennis Habermann came face-to-face in the long-awaited “brother duel”. It became clear that the two were not “inflating” each other’s points, but were fighting absolutely hard for victory, as even a veteran like Dennis succumbed to his nerves at the start and clearly went over a red light of over two and a half tenths of a second and was thus disqualified. Timo must have seen his brother’s “red light” and not only won the NitrOlympX, but also the better time of 5.401 seconds. 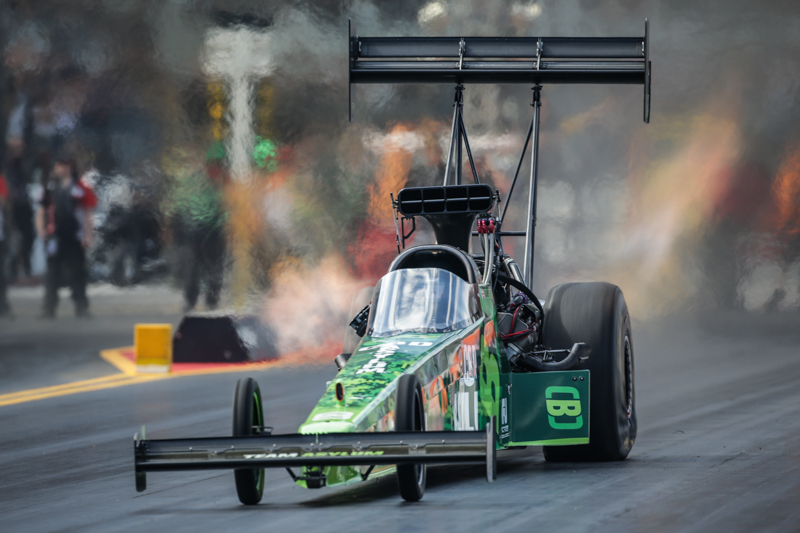 The brothers from Langenselbold also took another important step towards continuing to bear the start number one and two on their dragsters in the 2019 season. Many runs in the Pro Modified Cars were also decided by the drivers’ composure. In the final, Micke Gullqvist and Jan Ericsson faced off to determine who the faster Swede is. Gullqvist left the starting line first, and Ericsson gave everything on the 402 metres to catch up with Gullqvist. But even this courageous ride down the quarter-mile could not prevent the victory of Micke Gullqvist. With a fantastic 5.976 seconds at 392 km/h, Gullqvist took the victory and the important points in the fight for the FIA European Championship. The great battle of the Super Street Bikes was won by the Briton Graham Balchin. The international starters became faster and faster during the final runs, and it became necessary to perform between 7.0 and 7.1 seconds to win the rounds. Balchin had a final time of 7.949 seconds, as his opponent Rick Stubbins became a victim of this weekend’s equipment battle and could not compete. As expected, the Super Twin Top Fuel Bikes was won by Marcus Christiansen, who clearly dominated the field with consistent 6.4s times. His opponent in the final, the Japanese Takeshi Shigematsu, struggled with major technical problems and could not match Christiansen’s performance in the final. NitrOlympX stands not only for maximum performance and variety on the track, but also for special fan proximity and attractions in the paddock. Thousands of spectators took the opportunity to look over the shoulders of the teams in the pit stop as they were working and visited the colourful food and retailer mile. Entertainment is also always an elementary part of the drag racing event at Hockenheim: For two hours, the popular Night Show on Saturday evening featured high-octane action exciting the audience into Mexican waves. The audience had barely processed the sensational jumps of the Red Bull FMX show before the first nitro bikes banged down the track and cult Night Show star Eric Teboul raced into the darkness with his one-of-a-kind rocket bike. The Top Fuel Nightruns with their ear-splitting sound and metre-high exhaust flames, as well as the crazy jet dragsters with turbine drive, thrilled the audience to the full.